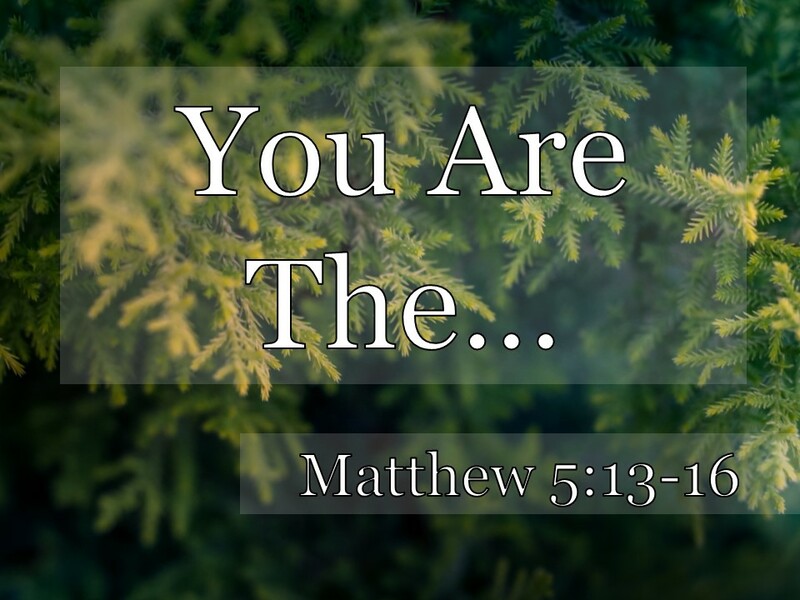 [Matt's Messages] "You Are The..."
This is Jesus’ Sermon on the Mount. Perhaps the greatest message ever preached, and certainly preached with the greatest authority by the world’s greatest teacher. We’re going to take a few months, in fact, to work our way through it. We’ve already dedicated three Sundays to Jesus’ Sermon, and we’re just 12 verses in! Jesus has gone up on a mountainside and is teaching a great crowd that have begun following Him. And He’s invited them to live the good life as His disciples. Jesus has invited them (and therefore us) to follow Him and to live lives that are blessed, full of well-being, in a word...flourishing. But, as we’ve seen the last two weeks, the good life is may be not what you might expect. The flourishing are those who are needy, sad, lowly, unsatisfied, and even persecuted. Jesus’ teaching is surprising; it’s counter-intuitive; it’s downright strange to our ears. Because it’s a teaching that comes from the Kingdom of Heaven which challenges all of the kingdoms that we know so well. Jesus is the King of the Kingdom of Heaven which is a very foreign country to our experience. It’s like nothing that we’ve ever seen or heard. We were made for this kingdom, and we don’t even know it. We long for this kingdom, even though we have not yet seen it. But now that it’s being revealed, we’re being made ready for it. To be ready for this kingdom means repentance. So from the get-go, Jesus is calling us to change. And the rest of His Sermon will rock our boats even more. He wants to turn our lives upside down. You can’t receive this message and stay the same. But today, I want to back up and read from the beginning of the Sermon. Because I realized something this big week that I have never noticed before. Never even thought about before. It was right there in front of me, but I’ve never seen it. Here’s my big insight. You ready? Verse 13 comes right after verse 12. What I mean is, who is the “you” there in verse 13? Who is Jesus talking about? Who is He talking to? It’s the same people that Jesus has been talking about and talking to from verses 3 through 12. The beatitudes people. The blessed people. The-strangely-enough-they’re-flourishing people. That’s who Jesus is talking about and to in Matthew 5:13-16 when He tells them, who they are. And we’ll have two obvious ways we will finish that incomplete sentence. The two ways that Jesus finishes that sentence in this paragraph. I’ve preached on this passage before, several times, but I’ve never really grasped that these words flow out of the beatitudes. They don’t exist on their own in some contextless-memory-verse kind of way. The “you” of verse 13 and verse 14 and verse are the same people who are called strangely-called-blessed in verses 3-12. Did you see how verse 13 flowed right out of verse 12? The “you” of verse 13 is the same “you” as in verse 11. The “you” that is blessed even though (or even because!) you are being persecuted for following Jesus. It’s the same people who have just been described as living out the upside-down good life described in the Beatitudes. That is who is salt and who is light. The followers of Jesus. Those who have become citizens of the kingdom of heaven by faith and are living a different kind of life. We’ve got two points this morning, and you’ve already guessed what they are. Now, notice that Jesus says that this is what you are. 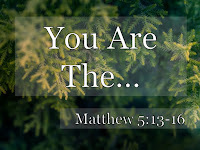 He’s not saying that we need to become the salt of the earth but that we already are the salt of earth–that is, if we are the “you” that He’s been talking about all along. Remember, last week, I said that He looked His disciples in the eye when He said verse 11. Well, He’s looking them in the eye again today. You know, that's a strange thing to say. We're used to it because we've heard this over and over again. But it's a strange thing to say, "You are the salt of the earth." Jesus is saying something different than that. You know, there have been at least 11 different interpretations of why Jesus uses salt in the Sermon on the Mount. Here’s one. This is a salt shaker that I stole from the Wild Game Dinner last night. We use salt on our food to flavor it. That could be a part of what is meant here. But I don’t think that was the biggest reason they used salt in the ancient world. What salt was mainly used for in that culture, that pre-industrial culture, before there was refrigeration was to preserve meat and to purify things. To clean things. Salt was a preservative and a purifier more than a seasoning. It was a flavoring, too. So, Jesus could be saying that we give flavoring to the world. But, I think that what Jesus is emphasizing is that Christ-followers deployed into the world are a preservative and purifying influence on the world. At least, we are supposed to. I think the main point of salt is that is has an effect. It has an influence. It does something. When you add salt to something, things happen. And when you add salt to meat, it doesn’t corrupt so quickly. So Jesus is saying that His followers will have a positive preserving effect on their world. But only if they don’t lose their saltiness. Did you see that in verse 13? Now, technically, salt can’t stop being salt chemically. But something that is called “salt” can start to get additives and impurities and contamination and not be worth calling salt any longer. Or worth using any longer. Like if you said, “Pass the salt, Pastor Matt,” and I passed this to you, and you sprinkled it on your excellent venison last night, but then you took a bite and you found out that I had added pepper and paprika and cinnamon and cumin to the salt. What if I added in some dirt, as well? There’s still some salt in there. It’s still “the salt,” but it’s lost its saltiness. The Greek there for “loses its saltiness” is actually something like, “becomes foolish,” as if the salt has lost its mind or gone off the righteous track. Can salt like that have a positive preserving purifying effect? No. It’s useless. It’s worthless. It’s “no longer good for anything,” except something to walk on. He’s saying that we are supposed to be different. We are like salt that has an effect on the Earth. But we are not supposed to become just like the rest of the Earth. We can’t preserve or purify anything if we allow ourselves to be contaminated. I don’t know about you, but I would hate for Jesus to tell me that I am basically a useless disciple. I’d hate for Jesus to tell me that I am a worthless disciple because I’m really no disciple at all! I’m not salt. Salt is sodium chloride. And look at me. I’m not sodium chloride. That’s not me. I’m everything but. What does it mean to be salt? It means to live out the values of the kingdom. It means to be a disciple of Jesus. It means to live out the virtues of the beatitudes. Because verse 13 comes after verse 12. Want to know if you’re salt? Are you pursuing purity of heart? Are you persecuted because of righteousness? You’re the genuine the article. But what if your life looks like the opposite of the beatitudes? What if you consistently choose the anti-beatitudes? What if you are prideful? What if you are unfazed by sin and suffering? What if you grab what you want when you want it instead of being meek? What if you don’t care about righteousness? You could take it or leave it. What if you refuse to show mercy? What if your grasp impurity to your heart? What if you love fighting and harbor bitterness? What if you run hide and run away from persecution pretending you don’t belong to Jesus? Well, then you are not salt. And as disciples go, you’re not worth very much. Do you see how Jesus is calling us to live out the good life that He has just laid out for the disciples? But like a Beatitudes person. Do verses 3 through 12 describe me? Am I salty at work? Am I salty in my relationships? Am I salty in my neighborhood? Am I salty in my family? And what do I need to do to stay that way? Because it’s only as we’re different from the world that we have a positive effect on the world. #2. YOU ARE THE...LIGHT OF THE WORLD. He looks them in the eyes and tells them that this is who they are. Now, Jesus is the light of the world, right? Absolutely. But we belong to Jesus so we are the light of the world, too. Notice, again. He doesn’t say that we become the light of the world. We are the light of the world through the gift of Jesus. But that light has purpose. It has a goal. What is the purpose of light? To shine, right? Light in the Bible means illuminating, purity, truth, revelation, glory. The whole point of light is to shine. Right? The other day, I used the flashlight app on my phone to find something in the shed at night. I have this app that turns the flash on my phone camera into a flashlight so that I can find stuff in the dark. So, I turned it on, but you see how I have this flappy thing on my phone case? Well, it was closed up like this. So the light was on but I couldn’t see anything because it was covered up. It wasn’t helping me at all, but it was still draining my battery! That’s what Jesus is saying. How dumb is it to light the lights and then cover them up? Now, here’s where my big insight plays in again. What are those “good deeds” in verse 16 that we’re supposed to be doing? They are not “good deeds” by being what we don’t do. Like what sins we don’t commit. It’s the positive things that Jesus’ disciples do. It’s living out the beatitudes! It’s hungering and thirsty for righteousness. The word for “good” in “good deeds” in verse 16 is kalos and it means beautiful. The things Jesus’ followers do are morally beautiful. They shine. Now, sometimes, they are going to do that and they are going to get persecuted. Verses 10-12 told us to expect that and to rejoice when it comes. But verse 16 tells us that some people will see our good deeds and praise our Father in heaven! I love that “Father in heaven.” That’s a mindblowing phrase. We are used to it, but it’s something that Jesus that is new with Jesus, a gift of Jesus, and it’s amazing. Did you notice that the Father gets the credit for our living out these good deeds? In the next chapter, some people try to do “good deeds” to get praise for themselves. But Jesus says that we should “let our light shine before men” that they may see our good deeds and praise our Father in heaven. Of course that means that we can’t hide. We can’t run away from following Jesus. I don’t know about you but when Jesus started to promise persecution, I started to think about how to protect myself from that persecution. Because I don’t like pain. But Jesus says that we are the salt to the earth. That means we’ve got to get out of the saltshaker and into the world. And Jesus says that we are the light of the world. That means that we can’t hide away and pretend we don’t know Jesus. Even if it means getting hurt for it! Jesus is calling us forward (no retreat!) to boldly follow Him and live out the values and virtues and norms and culture of the Kingdom of Heaven. You are the light the world. Are you acting like it? The world will sit up and take notice when we actually live differently than they do. For example, take our Hide the Word verse for right now. Live it out in real time and in real life. And not in your own strength. You can’t do it in your strength. But do it by faith. And the world will sit up and notice. Be the salt. Be the light. Not by being flashy, but by being Jesusy. And the world will see your good deeds and praise your Father in heaven. You know I am whatever is the righteous version of proud of you all. I love watching you put on something like the Wild Game Dinner last night. All of the work that goes into that. Food, tables, chairs, sound equipment, greeters, servers, door prizes, the time spent! Well, you are being meek when you serve like that. And you are hunger and thirsting for righteousness when you want men and women to trust in Jesus as their Lord and Savior. And when you serve like that, you are being peacemakers. Hoping to bring people into peace with God. And somebody might laugh at you for putting on the Wild Game Dinner. Because it’s not a fund-raiser. We don’t make any money at it. What are you doing all of that if you don’t make any money? Blessed are you if you put on a Wild Game Dinner for people just out of love and a desire for them to know Jesus! Well done. You are salt. You are light. Stay salty and let your light shine before men that they may see your good deeds and praise (not you!) your Father in heaven. [Matt's Messages] "The Good Life (Part Two)"
[Matt's Messages] "The Good Life (Part One)"